The Earth rotates on its axis. If you watched the Earth from the Moon, for example, you would see the oceans and continents drift past. The surface features of Earth would make it very clear that the Earth is rotating. The same is true for any object. If you were to spin a ball, for example, the texture of the ball’s surface would make it easy to see the ball is rotating. But what if the ball were perfectly smooth? Not just kind-of smooth, but so smooth its surface was absolutely uniform. In that case a rotating ball would look just like a stationary one. So how could you tell if it was rotating? This puzzle of rotation is more troublesome than you might think, and it strikes at the heart of some very basic physics. In physics terms, it raises the question of what constitutes an inertial frame of reference. Basically, if you were in an inertial frame of reference, you wouldn’t feel any forces pulling on you. If you were floating freely in deep space, for example, you would be in an inertial frame. Galileo used the idea of inertial frames to explain why objects seem to keep moving even when nothing is acting on it. The motion of an object is relative, Galileo argued, and an object moving at a constant speed is in an inertial frame, just as if it were sitting still. Newton agreed with Galileo to a point, but he struggled with the idea of rotation. As an example he proposed a theoretical bucket experiment, where a perfectly symmetrical bucket was filled with water. If the bucket is rotating, the water should flare out a bit, making a dip in its surface. If it isn’t rotating the water’s surface would be flat. Since the bucket and water are perfectly symmetrical, why should there be a difference? For Newton the answer was that there must be some universal inertial frame. There is a particular absolute frame of reference against which everything can be said to move. When the bucket rotates, it rotates relative to the cosmic inertial frame, and thus the water flares out a bit. While this seems perfectly reasonable, it was problematic for Einstein. In Einstein’s relativity there shouldn’t be any absolute frame of reference, since all reference frames can only be observed relative to each other. What would happen, Einstein wondered, if you were floating in deep space and saw the stars rotating around you. Since reference frames are relative, how would you know that you were rotating and the universe wasn’t? To address this issue Einstein invoked what he called Mach’s principle. It was originally proposed by Ernst Mach, and argued that an inertial frame is determined by the overall distribution of matter throughout the cosmos. Since all the stars in the Universe appear to be moving around you, it must be you that is rotating, and not the other way around. This all might seem like theoretical navel gazing, but it has real consequences for astrophysics, particularly for objects like black holes. 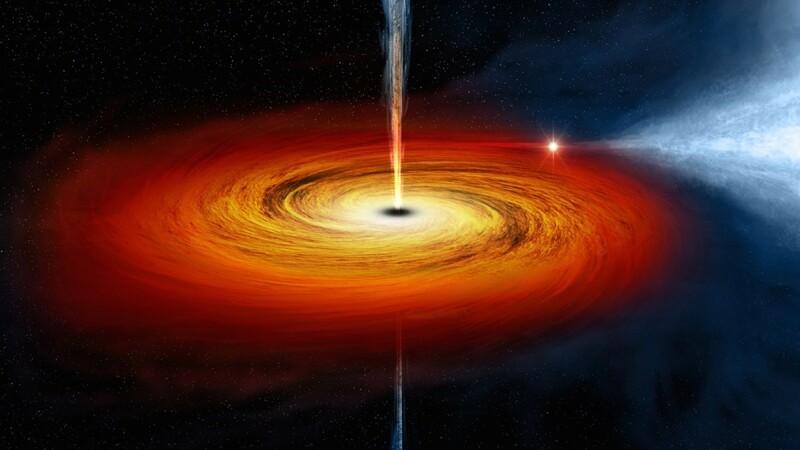 A black hole is an object so dense that not even light can escape it. One of the properties of black holes is the no-hair theorem, which means that no matter what shape a mass had before collapsing into a black hole, the resulting black hole (technically its event horizon) will be perfectly spherical. 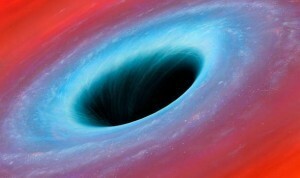 So in a very real sense a black hole is an example of a perfectly smooth sphere, rotating or not. So how do we know whether a black hole is rotating? Without any surface features to observe, we instead have to rely upon something known as momentum. The momentum of an object is a measure of its motion. In Newtonian physics the linear momentum of an object is the product of its mass and velocity. If an object is rotating, it has an angular momentum determined by its rotational speed and how mass is distributed in an object (moment of inertia). In Einstein’s relativity things are a bit more complicated, but objects still have a linear and angular momentum. What makes these quantities useful is that momentum is conserved, meaning that whatever momentum a system has, it always has. So if a rotating mass collapses into a black hole, the angular momentum it had before collapsing must still exist for the black hole. Since a rotating black hole must be spherical thanks to the no-hair theorem, how do we distinguish between a rotating and non-rotating black hole? It turns out angular momentum twists space. In general relativity gravity is not a force, but a curvature of spacetime. This means that gravity affects the overall structure of space and time. According to Mach’s principle, the overall structure of space and time must be inertial, and any rotation (angular momentum) must be relative to the global structure of spacetime. This means that angular momentum must twist spacetime near a rotating mass. As a result, any object near a rotating black hole wouldn’t simply fall straight in, but would appear to spiral around the black hole as it falls toward it. This effect is known as frame dragging, and we’ve actually observed it in Earth orbit. Frame dragging is how we can distinguish a rotating from a non-rotating black hole. So long after a rotating mass collapses into a black hole, and long after all that matter is hidden behind the black hole’s event horizon, the angular momentum of the mass still leaves its mark by twisting space around the black hole. I had no idea blackholes spin. There is probably a lot to be said and measured based on just that. Probably through (frame dragging?) and the rate which matter travels into a blackhole could determine how fast it’s actually spinning/rotating and perhaps the blackhole’s scale, unless there is already ways to do such a thing. An object in orbit around a star that has become a black hole already has angular momentum and if deflected towards the black hole by some force, would spiral into it. Even an object approaching a black hole tangentially and being captured by it will now be in a similar situation. How does one distinguish this from frame dragging? Also, it took a very sensitive experiment to measure the frame fragging around the Earth with Gravity Probe B. 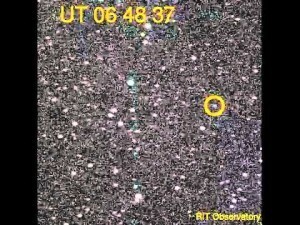 How do we measure that around a distant black hole? Since all is a wave function, couldn’t the spin of a black hole also be a humongous wave function that has integrated all the wave functions of whatever gives the black hole its mass? The notion of “motion of spin” then becomes something else other than a merry-go-round …. Bose Einstein condensates can be seen at the other extreme of “orderliness”. There is a unifying wave function within …. An ocean can have waves whereby the water does not travel…. Reach a criticality in density of matter, and all becomes calm, except the wave. Space-time becomes so precipitously steep at the junction of this wave, that radiation cannot “step over” the wall without slipping back in both space & time – whereby all frames of reference collapse into one…. etc. The main quality of matter is motion. If no motion, there might be no universe.